Do you have Acid in your Soil? You are here: HomeUncategorizedDo you have Acid in your Soil? Soil chemistry is very complex topic. There are laboratories and advanced college courses dedicated entirely soil science. Knowing the measurements of a few soil components can greatly increase the health of landscape plants and the lawn. When things go seriously wrong with the soil, plants will start to display some symptoms of nutrient deficiency. Potted plants, growing in a limited amount of soil, tend to show deficiencies much more. When grown in the ground, plants also symptoms indicating the soil needs some adjustment. When there is a problem with the soil chemistry, plants show stunted or abnormal growth. The pH and other factors affect the availability of nutrients. In some cases, elements and micronutrients, including metals, are unavailable to the plants. These type of deficiencies affect the production of chlorophyll. The yellowing of the leaves if typically related to a deficiency. Knowing the pH and amount of nutrients and metals is valuable in new and established landscapes. In some cases, when moving into an older home it might be beneficial to test for contaminants like arsenic or lead. A basic soil test includes the pH, and possibly the phosphorus and potassium content, which are important nutrients from strong roots and beautiful flowers. 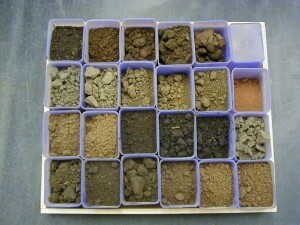 Ideally, a full soil test would also include the micronutrients iron, manganese, and zinc. For most of us, we don’t really know what was on the property before we arrived. To make sure the test is an accurate representation of the soil on-site, collect samples from two to three points around the yard. Take two samples if there’s an indication that topsoil was brought in or there are two areas with different characteristics. To get a good indication of the soil the plants will be growing in, dig a hole about six inches deep that is the levels where the majority of the roots will be growing. Collect soil samples using a clean garden tool. Dig into the side of the hole to collect clean soil for the most accurate analysis. For most yards with native soil, combining the samples from two or three places in the yard will give a good analysis of the general state of the soil. Allow the soil to dry overnight. The next day package a heaping one cup of soil in a zip lock bag for soil testing. Cooperative extensions all over the country offer soil tests through the mail as do independent laboratories. For preventative care, most common nutrient deficiencies can be prevented with a regular side dressing of humus or compost.